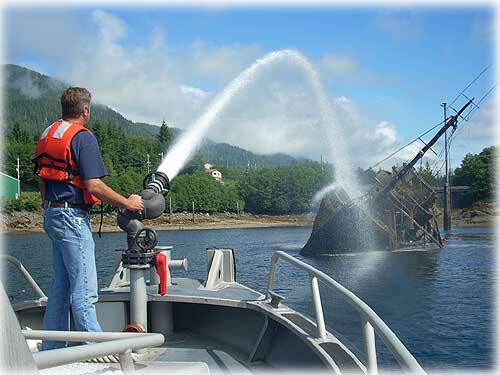 Saturday, a crewman on the Fireboat Harry Newell engages in a practice session on a warm, sunny day at Ward Cove. Alaska: Parnell Sworn In as Governor - Sean Parnell was sworn in as Alaska's 10th governor on Sunday before a Fairbanks crowd estimated at more than 5,000. Parnell will complete the term of Governor Sarah Palin, who stepped down on Sunday. 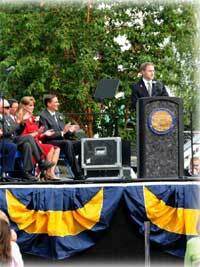 (from right to left) Alaska's new Governor Sean Parnell addresses the crowd at Pioneer Park in Fairbanks with temporary substitute Lieutenant Governor Craig E. Campbell and his wife, Anne Marie. With the Riverboat Nenana as a backdrop, Parnell told the crowd that he won't be constrained by a short-term vision, but instead will focus on Alaska's future for this generation and the next. Fish Factor: Dutch Harbor retains title as the nation's top fishing port By LAINE WELCH - For 20 years running, Dutch Harbor has retained the title as the nation's top fishing port. According to NOAA Fisheries' popular annual report, Alaska fishermen delivered 612.7 million pounds of fish and shellfish at Dutch Harbor last year, mostly Alaska pollock. The landings were down from 777 million pounds in 2007. Ports in Virginia and Louisiana pushed Kodiak down a peg to fifth place with seafood landings at 251 million pounds, a drop from 320 million in 2007. Ketchikan: BACK-TO-SCHOOL IMMUNIZATION CLINICS - The Ketchikan Public Health Center will be holding several Back-to-School immunization clinics during the month of August. Students in kindergarten through sixth grade will need two medically-verified doses of varicella (chickenpox) vaccination or a history of chickenpox disease recorded by a medical provider on the State of Alaska immunization exemption form in order to attend school. Southeast Alaska: JUNEAU MEN INDICTED BY FEDERAL GRAND JURY FOR ILLEGAL HALIBUT SALES - United States Attorney Karen L. Loeffler announced Friday that David Skrzynski and Jason Maroney, both of Juneau, Alaska, have been indicted by a federal grand jury in Anchorage on charges of violating the Lacey Act by selling halibut that was taken in violation of federal regulations. The nine-count indictment names Skrzynski, 58, and Maroney, 38, as the sole defendants. National: Study of Achievement Gaps Shows Native Gains - A study of achievement gap patterns of American Indian and Alaska Native students in 26 states questions common stereotypes about lagging performance among Native students. REL Northwest, operated by the Northwest Regional Educational Laboratory, analyzed state achievement test scores in reading and math for AI/AN grade 8 students and their non-Native peers between 2003/2004 and 2006/2007. The results indicated that in many states serving large populations of Native students, American Indian and Alaska Native students experienced achievement gains along with their non-Native counterparts. Although achievement gaps were generally found to persist, AI/AN students were narrowing those gaps. In some states, AI/AN students actually increased their lead over their non-Native peers. Alaska: Are Alaska's glaciers growing? By NED ROZELL - Recently, several people have contacted an editor at the daily newspaper in Fairbanks about Alaska glaciers. The editor reports that a few people claim that almost all of Alaska's glaciers are getting bigger. Hubbard Glacier, one of the few growing glaciers in Alaska, advances toward Gilbert Point north of Yakutat in summer 2009. Photo by Bruce Molnia, USGS. Glaciologists who have studied Alaska's ice for years say the opposite is true. A handful of Alaska glaciers are advancing and a few of those are getting bigger, but those are the exceptions. Most are getting smaller, fast. Part of the confusion may come from recent news of glacier advances in places like Icy Bay, where masses of ice have spilled deeper into the bay than they have for years. 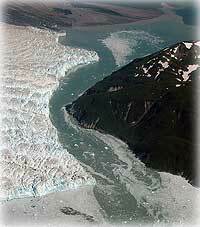 But an advancing glacier might not be a growing glacier. Such is the case in Icy Bay, according to Chris Larsen of the University of Alaska Fairbanks' Geophysical Institute. "Even though they are advancing, we have precise, recent laser data that shows the glaciers in Icy Bay have the greatest thinning rates of anywhere in Alaska," Larsen said. For example, Guyot Glacier lost about 150 feet a year in elevation where it spills into the sea, Larsen said, and this has occurred the last three years. The steepness of the terrain at Guyot's snout causes the ice to flow very fast, which spurs it to advance quickly. Along the northern border of Guyot Glacier sits Yahtse Glacier. Larsen and his colleagues measured Yahtse and found that it shoved forward about 50 feet every day in June. Both Guyot and Yahtse are located in Icy Bay, about 70 miles northwest of Yakutat. "Terminus advance, in this case, is not a sign of a healthy glacier," he said "Quite the opposite."